Update, December 6: The full trailer for Before the Storm’s final episode is here. After a quick teaser accompanying the release date announcement earlier today, Life is Strange developers Dontnod have provided a feature-length trailer for the final chapter of Before the Storm. Life is Strange: Before the Storm is a masterclass on how to make a prequel. Naturally, Chloe wants to help Rachel any way she can, and that means standing up against knife-wielding threats, getting into arguments with her stepdad, and running an 18-wheeler off the road in a pickup truck. Also, apparently, throwing trophies through windows. Hell is Empty will conclude the Before the Storm story on December 20. Original Story, December 6:Life is Strange: Before the Storm’s third and final episode will release later this month. Episode three, Hell is Empty, will release on December 20. The full trailer for the game will release later today, but for now you’ll have to make do with a 14-second teaser trailer. Given that trailer’s length, there’s not a lot to go on, but we do know that Chloe and Rachel return to the junkyard, this time in the (slightly dangerous) company of Damon, the dealer who we first met during episode two. Eagle-eyed viewers might also spot a change in Chloe’s hair. Since last episode, she’s added a telltale blue streak, pointing towards her hairstyle from the original game. You can check out the teaser above, and I’ll update this story with the full trailer when it releases at 17:30 GMT this afternoon. While Hell is Empty will be the final episode of Before the Storm, there’s also a bonus episode, Farewell, which documents Max’s departure from Arcadia Bay, and will be out early next year. 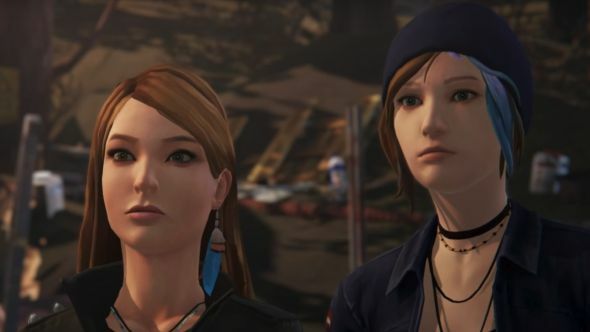 Happily, now that the voice-actor’s strike is over, that episode will feature Life is Strange’s original voice actors, Ashly Burch and Hannah Telle, as Chloe and Max.